Codes and puzzles such as cryptograms often use letter substitutions to encode messages. Decoding these messages involves looking for patterns and often the simple ones can be decoded by analyzing letter patterns and frequencies. Many different types of codes have been used throughout history to encrypt messages so that enemies could not intercept them. Caesar is said to have used a simple shift cipher to encode messages. 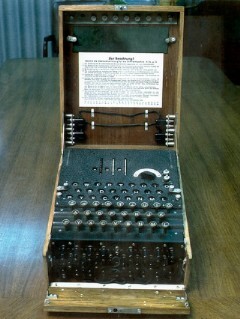 The enigma machine, pictured to the right (from Wikipedia.com), is an example of how encryption was used in WWII Germany. The Navajo Code Talkers used their native language to help the Allied forces encode messages that were difficult to decode. Cryptology or cryptography is the mathematics of codemaking while cryptanalysis refers to the mathematics of codebreaking. This field of mathematics has become increasingly complex and important with the pervasiveness of internet access to business and personal information. Mathematical encryption is used to ensure that personal information is transmitted across the internet and stored safely so that it cannot easily be read by others. See Data Investigations: Codemaking & Codebreaking for pictures and descriptions of codebreaking activities. See Navajo Code Talkers for links to how Navajo Code Talkers used their native language to encode messages during World War II. See Cryptograms for links to try codebreaking skills by using the frequency of letters in English messages. 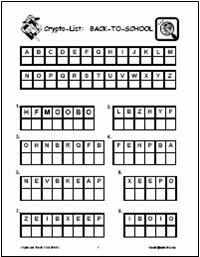 See Crypto-Lists for encoded lists students can try to decode using frequencies of letters. [See Back-to-School sample at right.] These lists are an easy introduction to codebreaking as students brainstorm words that fit the category and try to identify a starting word, then use those letters to help decode the other words in the list. Download PDF files for these crypto-lists: Back-to-School, Halloween, Thanksgiving, Winter, Algebra, Data, Number Sense. 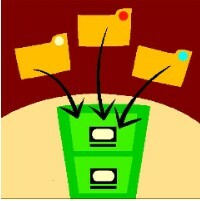 All files contain an answer sheet. Spider Web Map Coloring Games require students to use map coloring rules to capture the most points in these web coloring games. The games encourage students to apply discrete math map coloring skills and develop winning strategies. The file contains two different versions of the game, directions for each and a recording sheet. Spider Game - 1 develops student understanding of the probability of the outcomes of tossing a single die. This game is a twist on Pig in that tossing a 6 means the spider takes all of the counters you have been able to remove from the board. The file contains the gameboard, directions and a student recording sheet. Spider Game - 2 develops student understanding of the probability of the outcomes of tossing two dice. 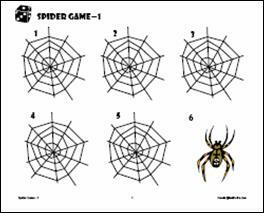 Students toss two dice, calculate the difference of the two dice and remove a counter from that spider web. But beware, if the difference is 0, the spider takes the counters the student has already removed and the student earns no points for the round. This game is a twist on Pig and student understanding of probability helps them develop effective strategies for winning the most points. The file contains the gameboard, directions, a student recording sheet and a handout that requires students to chart the different ways of tossing a difference of 0, 1, 2, etc..
See all Fall 2006 Math Activities including Bat Math, Fall Glyphs, Fall Coordinate Graphing, Fall Problem Solving and Additional Fall Math Activities. 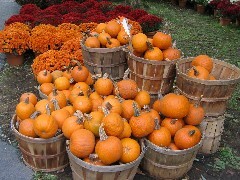 See all Fall 2005 Math Activities including Measurement Man, Pumpkin Activities, Symmetric Faces, Coordinate Graphing, Pumpkin Problem Solving and Links to Internet Activities. This page also includes pictures of seasonal student work.